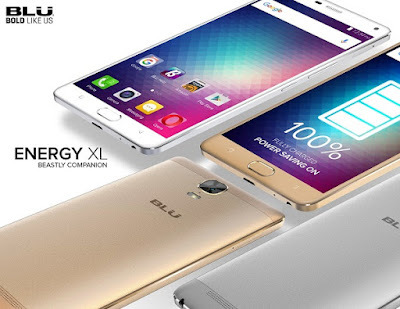 BLU launches Energy XL with 6-inch display, fingerprint sensor and 5,000mAh battery. BLU Products today announced the launch of the Energy XL with 30 days stand-by, or up to 3 days of standard usage on a single charge. The BLU Energy XL now available exclusively on Amazon.com at a price of $299 (USD) unlocked, with 4G LTE support nationwide on T-Mobile and AT&T Networks. BLU's Energy XL features a 6.0-inch Full HD Super AMOLED display (1080 x 1920 resolution, 367 ppi), and protected by curved Corning Gorilla Glass 3. The BLU Energy XL is powered by MediaTek MT6753 64-bit octa-core processor, paired with 64GB of internal memory and 3GB of RAM. The BLU Energy XL comes with an ultra-fast Finger Print Sensor and sports a 5,000mAH battery with Quick Charge. The BLU Energy XL boasts a 13 megapixel main camera featuring advanced, second-generation Optical Image Stabilization (OIS), F/2.2 aperture, 1/3 inch sensor + 5P lens, real-time HDR, and Phase Detection Autofocus (PDAF) with super-fast laser autofocus. A dedicated camera button provides lightning fast access to the ideal shot. The main camera is paired with a wide-angle 5 Megapixel front facing camera including customized face beautification software for any touch ups needed. + 9V/2A quick charger; four hours of phone call talk time with a 10 minute charge. 10 mins to 15%, 30 mins to 43%. + DTS surround sound audio technology. + Device unlock with a simple fingerprint touch in less than 10ms. Also, lock the files on device quickly and safely. + USB Type-C 2.0 for a symmetrical design charging port for easy handling.